I really like Streamlight’s products. They are durable, do what they are supposed to do, and often have features you won’t find in other lights. The Super Siege Lantern is a prime example of all of that. The Super Siege is sort of a combination area light, work light, and portable charger all in one. This is the big brother to the Streamlight Siege, which I reviewed a while back. The Super Siege stands 7.5” tall and weighs in at 1lb 14oz. This isn’t a light you’ll probably want to take with you hiking or backpacking. Rather, it is intended for use around home or work. It has an internal 8800 mAh Lithium Ion battery that is rechargeable. No need to mess with AA or AAA batteries with the Super Siege. Of course, the lantern comes with an AC power cord for charging the battery. High: 1,100 lumens, five hour runtime. Now, that 1,100 lumens is quite bright. In fact, if you’re working in a confined area, it’ll probably be too bright. However, outdoors at night, it’ll light up much of your backyard without trouble. A really nice feature of the Super Siege is this glare guard. It is removable and it can spin around the lantern to wherever you need it. What it does is keep the light from shining into your eyes as you carry the lantern. Even at the mid setting, 550 lumens is likely brighter than most of the flashlights you have sitting around the house. Great for working on the car or keeping the boogeyman way during a power outage. The Super Siege has two D ring attachment points, one on top and one on the bottom. These make it easy to hang the lantern just about anywhere you need it. It also has a swing out handle, which makes it easy to carry as well as hang. The polycarbonate cover serves to soften and diffuse the light for an even cast. However, it can be removed if you need a more directional spotlight. Just below the power button is a rubber cover that protects the charging port as well as a USB port. The USB port can be used to charge your cell phone, tablet, or other portable device. This is a very cool, very handy feature. On a full battery, the Super Siege will charge most smartphones about 4 times or most tablets twice. This assumes, though, that you aren’t using the lantern in between phone charges. In my experience, you can get a few charges for your phone and still get several hours of illumination on the medium setting. As the power is used up, the power button goes from green to yellow to red. This lets you know when you need to start looking for a power outlet to charge it up again. Now, here’s a great example of the innovation present at Streamlight. Since there’s no need for a battery compartment, due to the fact that the battery for the Super Siege is internal, the engineers and designers decided to not let that empty space go to waste. The base of the Super Siege spins off to reveal a small hidden storage compartment. 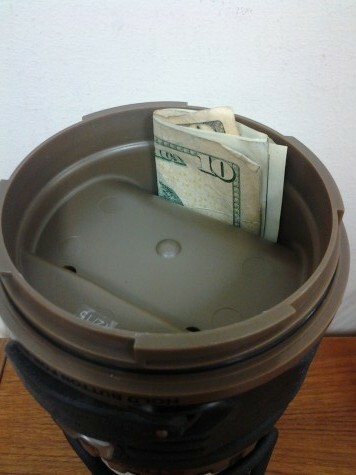 It isn’t very big but you could stash some money or a couple of keys in there for safekeeping. It is waterproof, too, due to an O ring seal. The Super Siege floats if dropped in the water. It is waterproof, though I don’t know that I’d want to leave it floating for days on end. 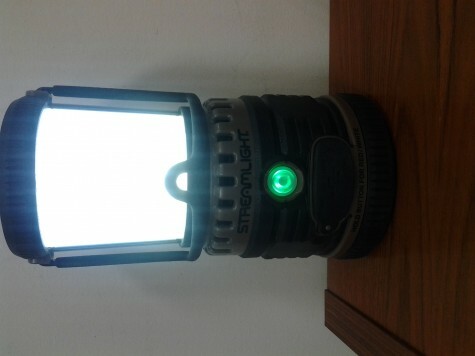 All in all, I think Streamlight has another home run here with the Super Siege lantern. It is ruggedly constructed and will put up with quite a bit of abuse. It is made for actual work, not just to sit in a tote or pack. Keep it on the shelf in the workshop and you’ll find yourself reaching for it again and again. If you do any RV style camping, toss it in with your gear and you’ll be able to light up the entire site every night you’re there. The Streamlight Super Siege is available here on Amazon for about $115.